With Seoul off for the weekend, Busan takes centre-stage on Sunday with a bumper 15-race program. And with the South-Coast track itself dark next week, plenty will be looking to head into the vacation on a positive note, including top trainer Kim Young-kwan. 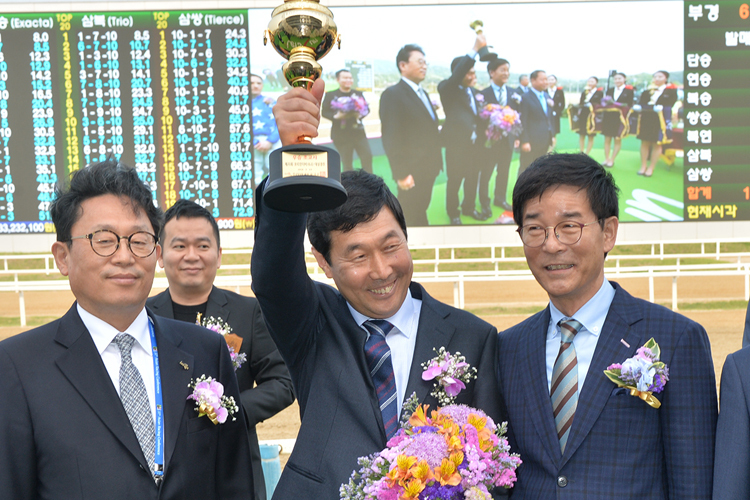 The past month has been a quiet one for trainer Kim Young-kwan. Since the start of July he’s led in six winners, joint-top among all the track’s handlers but still low by his standards. He did, of course, send two horses to Singapore for the KRA Trophy two weeks ago – both ran well – and then had to contend with the disappointment of losing stable star Power Blade to a fractured sesamoid a day before he was set to jump favourite in the Owners’ Cup. Kim sends out seven runners on Sunday and his three-year-old colt World Day is one of three up-and-comers that make race 10 a tantalizing prospect. World Day only debuted in April but has won three of four starts so far, going down by a neck in his sole defeat and he faces two other very competent three-year-olds in the shape of Great Rock and Cheonnyeonuitaeyang over seven furlongs on Sunday. All three of them come in having won their latest assignments and all look to have more to offer. Kim could have a winner earlier in the day when he sends out two-year-old Glitter in race 4. The Officer colt ran well on debut a month ago and will be favoured to score in the juvenile maiden. Rounding out the card, Kim’s Finest Warrior also looks the most likely in race the only class 1 race of the entire weekend. He was overmatched in the SBS Sports Sprint in Seoul in June but beat four of his seven rivals on his return to Busan last month. In other races, the latest of the “Blades” to roll off the production line should score in race 9. Gioi Blade has won three of four so far and drops back to 6 f today. Favourite backers will also be getting stuck into I’m Your Star, who took eight goes to get his maiden win but shouldn’t have to wait too long for his second in race 6. There are 15 races at Busan on Sunday with the first at 10:45am and the last at 6pm local Korea time.